The Utility interacts and depends on many departments and organizations. These are a few of them. Waukesha Wastewater Treatment - The water you consume is treated and returned to the water cycle. Currently the department is urging everyone to Slash the Salt. Waukesha Department of Public Works - Many of our water mains are replaced while the City is doing other street work. Wisconsin Department of Natural Resources - Regulates Construction projects and Water Quality. 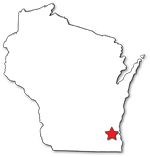 Wisconsin Public Service Commission - Regulates Construction, Utility Operations, Customer Service, Rates, and Billing. Wisconsin Water Association - Provides professional education and keeps us current on the emerging issues. Wisconsin Rural Water - Active in legislative affairs and operator training. WaterSense - An important partner in our efforts to conserve water. The Milwaukee Water Council - A hub for those involved in water research, education, technology development, and industry. Wisconsin Water Conservation Coalition - Educate public about local drinking water resources and encourages sustainability.